A specified maximum or minimum area. By a view-based draft angle. Faces that are connected to a selected face. The ExtractMeshFaces command separates selected mesh faces from the parent mesh object. This command works best in shaded mode, because you can pick the shaded mesh faces as well as the face edges. Extracts the mesh faces leaving a hole in the parent mesh object. The ExtractMeshFacesByArea command separates mesh faces that are within a specified range of area from the parent mesh object. The ExtractMeshFacesByAspectRatio command separates mesh faces from the parent mesh object that are greater than the specified aspect ratio limit. ExtractMeshFacesByAspectRatio finds mesh faces that are very long compared to their width. A ratio of 25:1 or above is considered long. In the image, the extracted red faces have an aspect ratio of 9:1 or more. The ExtractMeshFacesByDraftAngle command separates mesh faces from the parent mesh object based on the angle of the faces to the view. 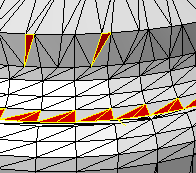 ExtractMeshFacesByDraftAngle can split a mesh object for molds or to look for undercut areas. 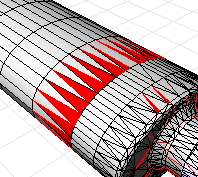 In the example, the mesh faces were selected in the top view. 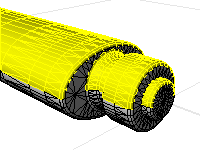 Makes polylines out of the edges of the selected meshes instead of extracting them from the parent mesh object. The ExtractMeshFacesByEdgeLength command separates mesh faces from the parent mesh object that have an edge length greater or less than a specified value. 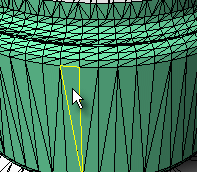 ExtractMeshFacesByEdgeLength removes small or large mesh faces that do not belong in the mesh object. In the example image, the extracted red faces have an edge length shorter than 0.1. The ExtractConnectedMeshFaces command separates mesh faces from the parent mesh object that are connected to a selected face. 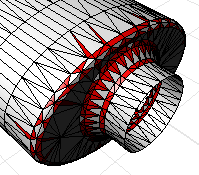 The ExtractConnectedMeshFaces command extracts a set of mesh faces from a joined mesh object based on a specified break angle. This can be used to extract a series of mesh faces that make up a planar surface in a mesh object or to extract set of faces that make up a coherent feature in the mesh. The ExtractDuplicateMeshFaces command separates duplicated mesh faces from the parent mesh object. The ExtractMeshPart command extracts all mesh faces radiating out from the selected face to naked or unwelded edges in the parent mesh object.